Seafood is a nutritionally balanced food. This sauteed salmon is quick and easy. Heat oil in skillet on medium heat. 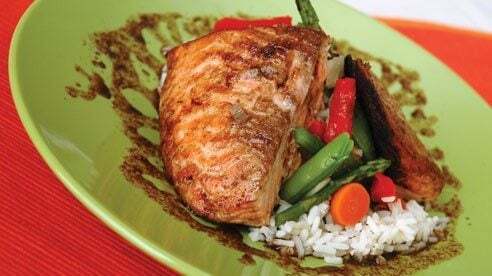 Add salmon steaks. Combine butter, soy sauce and garlic. Baste salmon. Cook about 5 minutes. Turn, baste again, place lemon slices on top and cook until salmon flakes easily – about 10 minutes.